Eric Hosmer was drafted 3rd in 2008 for his rare combination of size and tools. He’s viewed primarily as a potential slugger, but his game offers much more than home runs. His swing is level and smooth, and he covers the plate well considering his size. He has power to all fields, and he is almost too willing to take outside fastballs to the opposite field rather than waiting for a pitch that he can pull over the right field fence. Last year, Hosmer displayed his ability to hit the other way with most of his 27 doubles going through the gap in left field. His batting eye fits his size and swing perfectly, making him a complete power-hitter. While he has 30 home-runs potential, his strength rests in his well-rounded offensive abilities. Besides his potential plus-plus power, Hosmer will offer batting average, on-base skills, and is adept at racking up doubles to both gaps. I believe at this point of his career, Hosmer is more of a contact hitter then power hitter. In addition to his bat, Hosmer has gained respect throughout the league because of his glove and arm. Hosmer in high school could throw 95 mph. While that doesn’t matter at first base much, it can still be useful when turning two. Furthermore, Hosmer has displayed his leather skills with numerous scoops. His long length helps him to be able to snag more balls then usual. He is no Big Poppa Fielder (Prince Fielder). He actually has movement to both his left and right. 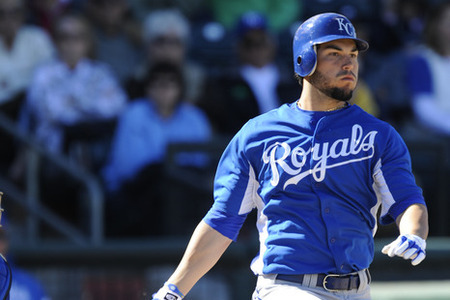 As long as he develops as planned, Hosmer’s ability at the plate and in the field will make him a perennial All-Star. While he has plus-plus power potential, he has yet to consistently show his HR power. So far in his career he has mostly displayed his power for doubles. According to J.J. Cooper of Baseball America, many in the Royals organization see a likeness between Eric Hosmer and 1989 NLCS MVP, Will Clark. Will Clark was just on the ballot for the Hall of Fame. Hosmer covers the strike zone very well, and he’s always been solid in the BB/K area although this year he struggled with (34/820) (Not great, but what is expected of a rookie). Hosmer also hits them where they are pitched spraying the ball all over the field. Hosmer has the rare ability to fight off pitches he really can’t handle allowing him to extend at-bats. To hear some scouts talk about how his approach and swing remind them of a combination of Joe Mauer and Joey Votto, is a promising sign for Hosmer and Royals fans alike. Hosmer didn’t have a problem in hitting for a decent average right off the bat (Yes, I meant for that pun, and, yes, I’m witty). Given that he plays first base, patience could wear thin if he is does not hit 25 home runs. Of course, he is not where he will be in five years especially with his power. Royals first baseman Eric Hosmer finished his rookie season with 19 homers, 11 base swipes, 78 RBIs, 66 runs scored and a .293 batting average. Hosmer has the most potential out of any player for the Royals. Keep in mind Hosmer was in contention for rookie of the year although he was called up on May 5th. I predict Hosmer will have a .301 batting average with 25 Home Runs. Hosmer will score 90 runs while driving in 100 RBI’s. He will snag 13 bases. Expect his slugging percentage to be around .500, and he will improve with his ability to see the plate as he will be walked 41 times. I predict him to strike out 84 times. Hosmer won’t be a free agent until after the 2017 season, and Royals fans should be extremely excited when thinking about the future mostly because of Hosmer. He is for sure the piece the Royals will be looking to build around. This entry was posted in Baseball, Baseball, Home, Midwest, National, Uncategorized and tagged Eric Hosmer, Kansas City Royals, MLB.